It's come to my attention that some of my readers are a little unsure of themselves with respect to broccoli rabe -- a situation that needs to be corrected ASAP! Broccoli rabe (pronounced RAAB; also called rapini, or just rabe) is a plant of the mustard family which also includes cabbage, kale, broccoli, cauliflower, and mustard (genus Brassica). As you can see, the family resemblance to broccoli is strong. Braccoli rabe has long been popular in Southern Italy, and in the last ten or so years has become widely available in the U. S. Like some of its relatives, it's slightly bitter, but once you develop a taste for it you'll be coming back to it again and again. Long time broccoli rabe devotées (like me) can work up a good bit of passion for this simple weed! This is the basic method of preparation, no matter whether you're going to serve it as a side dish, as I usually do, or in combination with other ingredients (subject of future posts). In a roomy heavy-bottomed pot with a lid, sauté the rabe in the oil over high heat, tossing constantly with tongs, for a couple of minutes. When the rabe is all coated with the oil and has turned a brighter green, add in the garlic, hot pepper flakes (if using) and broth. Cover tightly, lower heat to medium-high, and cook for 4 minutes. Toss the rabe with the tongs and replace the cover and let them sit in their steam for another 5 - 10 minutes. Season to taste. 1. Blanching. Many recipes I've seen call for a brief blanching prior to sautéing, to reduce the bitterness. I've never felt the need to improve the taste so I haven't tried this. I guess if you don't like the bitterness you could try it, since so many people think it's a necessary step...let me know the results if you do! better known as "cime di rapa" and best cooked with orecchiette :) they are gorgeous! Thanks for the primer! I'm still looking high and low though haven't been to Whole Foods for forever, it's a likely find there. Maybe I'll make it the "March" vegetable, like fennel is for February. I do this, but add some chopped anchovy and panceta to the mix -- it's a killer. I love broccoli rabe, but never made it this way. I learnt to make broccoli rabe with sausage from an Italian friend and now it is a favorite in our home! I think I have finally convinced my store to get this for me. These look fantastic! I like to add a few chili flakes for some heat! I just had rapini prepared in the most perfect way -- or at least I think... Instead of pancetta, grill some flavoured sausages like basil or sundried tomato, slice them up with and further caramelize with onions. Add white wine and saute. Then fold in cooked bowtie pasta and the prepared rapini. Sprinkle generously with freshly grated Parmesan cheese. Powerful and complementary flavours that are to die for. 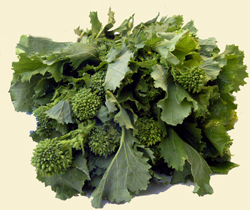 PLEASE share your sources for fresh Broccoli Rabe in the Raleigh/Cary area - cannot seem to locate it anywhere! Rapini stems are delicious raw. I cut them off at about the level of the lowest large leaf, saving the tops to cook, then peel them, cut them into inches, and add them to salad. Just one more way to love this stuff.